View More In Textiles & Costume. Textiles of the Middle East and Central Asia explores the significance and beauty of textiles from across the Middle East, Turkey, and Central Asia. This vast region has been the focus of population movements, exploration, and trade for thousands of years and is home to a wealth of textile traditions. From the intricate embroidery on a Palestinian wedding dress to the complex iconography on an Afghan war rug, textiles reflect the beliefs, practices, and experiences of people from these lands. The book is arranged thematically with pieces grouped according to their purpose or meaning, enabling, for example, the comparison of domestic furnishings, wedding attire, and children’s garments from across the region. The book also includes contemporary works that grapple with modern political issues. The textiles featured include male and female garments, hats and headdresses, rugs and felts, children’s clothing, dolls, tent hangings, amulets and animal harnesses. 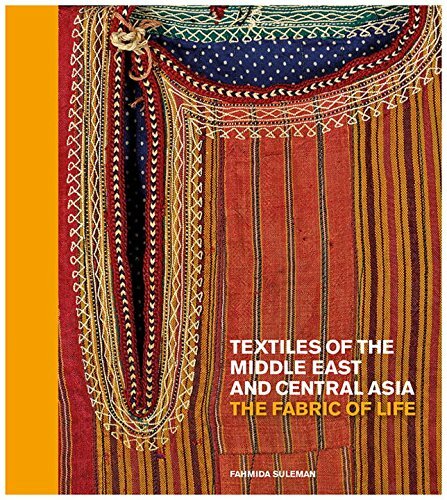 Focusing on the British Museum’s remarkable collection, Textiles of the Middle East and Central Asia offers a wealth of creative inspiration and will be essential reading for anyone interested in textiles and the cultures of the Middle East and Central Asia. If you have any questions about this product by THAMES HUDSON, contact us by completing and submitting the form below. If you are looking for a specif part number, please include it with your message.